An evil Goa'uld System Lord, once SG-1's arch enemy. He is the brother and mortal enemy of Ra, the sun god. In ancient Egyptian mythology, Apophis is the serpent, the god of the night and of death, and is in constant struggle with the god of the day. Apophis invaded Earth and Abydos in search of Goa'uld hosts shortly after the humans destroyed Ra. 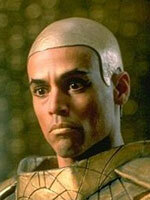 Apophis took Sha're, Daniel Jackson's wife, and Skaara -- Sha're's brother and friend to Colonel O'Neill. Sha're became host to Amaunet, Apophis' queen, while Skaara became host to Klorel, Apophis' son. Apophis was a powerful System Lord, but had many enemies, especially Sokar and Cronus. His attempt to invade Earth was thwarted by SG-1. Apophis died of wounds inflicted by Sokar, but was resurrected by Sokar and further tortured. For a number of months, he served as First Prime to Bynarr, warden of Sokar's prison moon of Ne'tu. His alias there was Na'onak. He later escaped Ne'tu to Sokar's home world of Delmak, where he assumed control of Sokar's vast army after the latter's death. But when his ship was taken over by the Replicators, Apophis crashed into the atmosphere of Delmak and is now presumed dead. Apophis and Sha're have a son, Shifu. The child is a Harcesis (the child of two Goa'ulded hosts) and possesses the collective knowledge of the Goa'uld who fathered him. Read more about the real-life mythological figure on which this character is based at the Encyclopedia Mythica. From his website: "I was born in Kingston, Jamaica (B-day Dec.31) and raised there thru High School......graduated with a B.A. in Geography/Archeology from Nottingham Uni. in England before moving to Canada where I currently live and work. "Acting became my calling after a few theatre roles and years on the modelling scene......the filmography section of this site has a pretty accurate summary of my work and is still being added to. .
"Series work on Neon Rider/DaVinci's Inquest and of course Stargate SG-1 has allowed me to continue acting and to do other career building roles in film and TV......of these, Soul Survivor, written and directed by my brother Stephen is extra special to me. "Recently I have been travelling alot......both for work (e.g. Relic Hunter ) and for conventions......these Cons have opened a whole new world for me and it has been a pleasure to meet many of you and visit new places such as Sydney,Auckland, Berlin and my old stomping grounds in England.........I hope circumstance permits me to continue this global tour."